Photographed just after dawn at Christmas in the mist and falling snow. This is certainly the most romantic and beautiful of all the bridges across the Seine in Paris and I've been trying to get a decent photo of it for a while now. This is probably my best attempt to date. 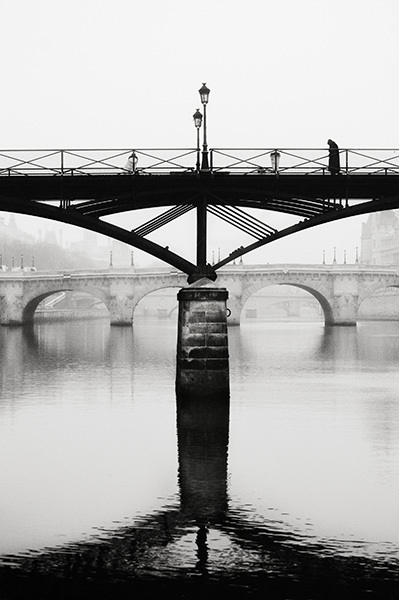 The 400 year old Pont Neuf is my second favourite bridge and you can see it in the background shrouded in the mist. I waited for this lady to cross the bridge to give it scale and the human touch. Although she is tiny compared to the bridge you can still see how her head is bowed against the freezing wind and swirling snow.